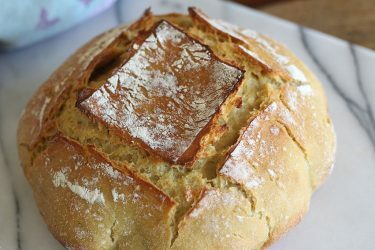 You’ll need an einkorn sourdough starter for this bread and I can show you how to convert your regular sourdough starter to an einkorn sourdough dough starter. You’ll need a few things that make a huge difference in how the bread turns out. I highly recommend using a 5 Quart Dutch Oven – a roaster pan or deep casserole dish with a lid will work too. A dough scraper is my new favorite tool while working to fold and knead my bread. You’ll also need a Kitchen Scale for measuring all ingredients. I found that my cup of flour and your cup of flour can vary greatly, and will affect the outcome. I promise you this bread will be worth it. This has made a huge difference in my bread making and it will help you too. 1/4 cup Einkorn Sourdough Starter (60 grams) Must be bubbly! Close to your bedtime, add the bubbly sourdough starter and warm water to a ceramic bowl. Mix them together with a whisk until well combined. Add the flour and salt to the sourdough mixture and combine together with a stiff spatula to incorporate the flour. The dough will be sticky. Then cover the bowl with plastic wrap and let rise for 10-15 hours – until the dough has risen or doubled. Flour surface again if the dough starts to stick and form into a round bowl shape. Generously flour the top of the dough. Line an 8-inch bowl with a towel and dust generously with flour. Make sure your hands are still floured and pick up the dough and place it in the bowl with seam side up. Cover the bowl and let it rest for 30 to 60 minutes. In the meantime, preheat your oven to 450 degrees. 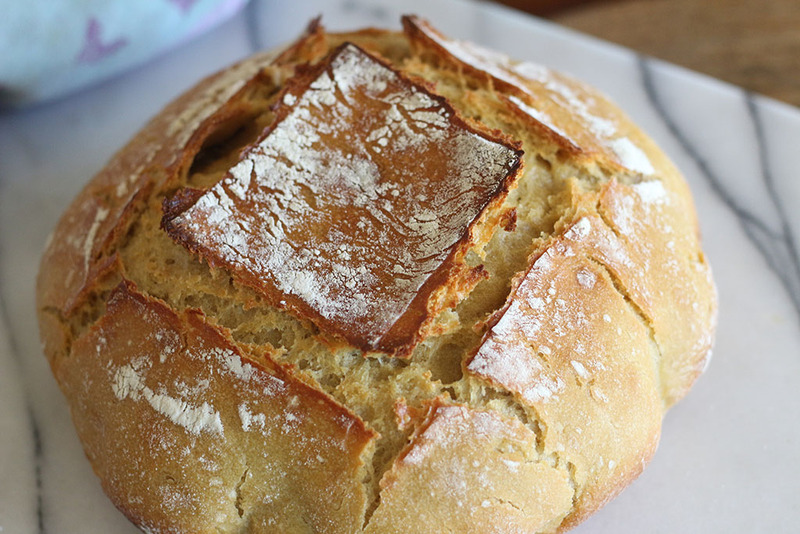 Cut a piece of parchment paper to fit your pot, leaving excess so you can grab the bread and take it out of the pot. Place your parchment paper over the bowl and invert the bowl to allow the bread to release onto the paper. With a small razor blade or serrated knife, score the bread with four slashes. Pick up the parchment and carefully place your bread in the pot. Place the lid on the pot and place in the oven for 40 minutes at 450 degrees. Then remove the lid and continue baking for 5 minutes longer to darken the bread if you’d like. When bread is done, take bread out of pot and place on a wire rack to cool for about 20 minutes to an hour, although we often can’t wait to eat it! Store loaf in a bag on the counter, or this bread freezes beautifully.